Hi! I've been on BoAjjang for a while and I'm still having problems of posting photos. Yes, I know you upload photos on a media sharing site ("Imageshack") and copy the link, pasting it into Image Properties. However, when I need to upload a lot of photos, I don't want to take up the space in one post. So I've been trying to upload photos with the thumbnail photo only, and the user can just click on the photo and view it in it's original size. And I'm having trouble trying to achieve it. Anyone want to guide me into doing so? I feel kind of pathetic trying to ask... it's seems really easy..
^ is this what you were trying to do? So, I'm a Photobucket user but for the sake of this instruction, I signed into my imageshack account. First of all, if you wanna do the thumbnails, you gotta do it manually with BBcode instead of using the Image button. For the example, I uploaded a picture as shown in the above post onto Imageshack, k? so that the text 'upload with imageshack' won't show up under every thumbnail. It sounds confusing but actually all you do is copying the code from Imageshack --> delete the "Upload with..." part ---> add .th in the proper position. 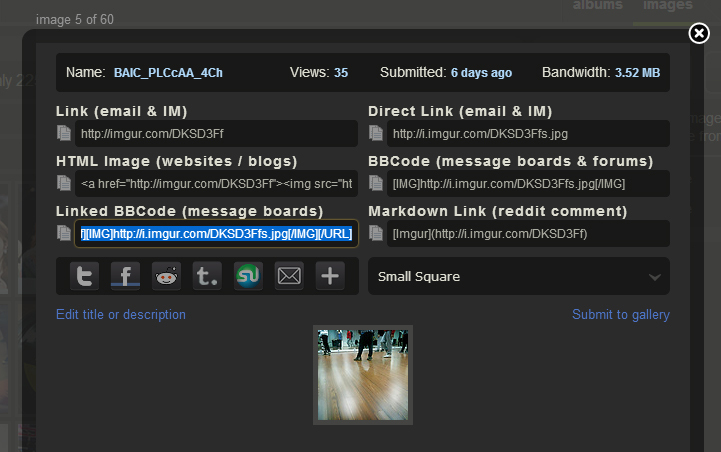 Just make sure to add .th in front of the JPG of the second link in between IMG, NOT the first link right behind URL. Hope this help anymore questions, feel free to ask . OH MY GOODNESS! Bam bam bam it's like MAGIC! Thank you so so so much! Wow! so kind of you to take your time to help me! Sorry for wasting your time and making you go on your imageshack account for my request. And my time wouldn't be wasted cuz many others can see this and know how to to it from now on . ^ Wow! Kudos to you yunapolaris! Really! Hi xxiicorina! If you need another option, I used imgur.com on all my threads. Once you've created your account and uploaded a photo, click it and this will come out: http://i.imgur.com/CAwPwNo.jpg - Copy the code and paste it in a "toggle editing mode." Voila! Wow, that seems simple as well, thank you so much, I'll consider it!! here a screen shot from Photobucket. Wow, look at that! Thanks for the suggestion!